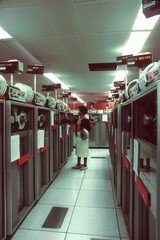 A computer laboratory with rows of machinery. The female technician aids in cancer research. Without it, it would be impossible to store and retrieve the vast amounts of information needed for detailed research projects.